Mobvoi has made a real effort to dominate the affordable Wear OS smartwatch market with options that don't skimp on features. The Ticwatch E, Ticwatch S and the more luxurious-looking TicWatch Pro all delivered on this premise. The new TicWatch C2 is the next step. The Wear smartwatch has got a spec sheet you'd usually find attached to pricier watches, wrapped up in an attractive design for an even more attractive price. So, how affordable is this smartwatch? Well, the C2 will set you back £179.99 putting it in the same price range as something like the Fitbit Versa. 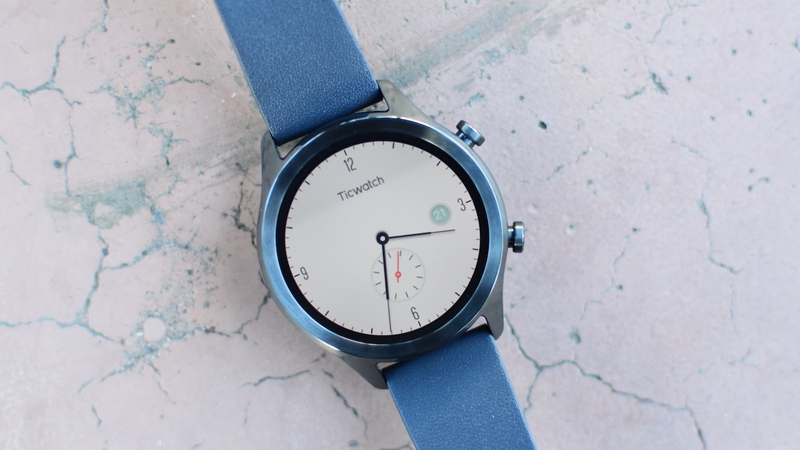 But how does this TicWatch Classic successor actually work in the real world? Is this another great cheap smartwatch to consider? I've spent a few weeks with the affordable Wear smartwatch to find out. Mobvoi's designs tend to work best when they go for a classic minimalist look, just like the adorable little TicWatch E. The TicWatch C2 is no exception. I reviewed the black version, but you can also get it in silver and rose gold. All of them have the same overall look with 20mm interchangeable straps. The bezel here isn't too big and bulky – it's to the point, showing off Mobvoi's nice watch faces. The sum of this is a smartwatch that looks more premium than its price tag. It's even comfortable to wear, though the leather strap is a bit… off. Don't get me wrong, the strap is fine – it's not super flimsy, but you can tell it's not some high-end leather band. For this price point, it's more than you expect, but the TicWatch C2's design almost lulls you into the feeling that it's higher end than it is. One other disappointment is the lack of waterproofing. It's IP68 certified, so you'll do fine in the rain, but if you want to swim with this thing you're out of luck (or wait for that swimproof TicWatch E2 smartwatch). Another slight disappointment is the screen. The 1.3-inch 360 x 360 AMOLED display isn't bad, but in bright situations it can be hard to see. It's not a deal breaker, but it is a spot where you can see the limitations of the price. More impressive is the sheer amount of tech – like GPS and a heart rate sensor – that Mobvoi managed to pack into a 13mm case. Plus, it's got a sleek build that makes it look and feel thinner than it actually is. Thus it passes the sleeve test with ease – wear this with a suit, or with a long-sleeve shirt, and you'll be golden. The TicWatch C2's price is going to make it a good first Wear OS smartwatch for a lot of people, so it's important that Wear OS works well here. And, well, for the most part it exceeds expectations. There was a bit of a hitch while setting up the C2 as it took multiple times to pair and it wouldn't keep a connection to my iPhone, but after a period of uncertainty it started working A-ok. There's no Snapdragon 3100, the newest Qualcomm chip that you'll find in the Fossil Sport and Montblanc Summit 2, but the Snapdragon 2100 chugs along perfectly fine. This watch flies. I've been testing the C2 for a couple of weeks now, installed multiple apps and used it all day, and I've not seen any slowdown. This makes it a good showcase for the new, more swipey Wear OS. Swipe to the right and you have your Google Fit rings; swipe to the left and you have Assistant; swipe down and you have notifications; swipe up and you have your quick settings. There's also NFC for Google Pay, a heart rate sensor and built-in GPS. The only major smartwatch feature missing is LTE and, if it's something you really care about, an Sp02 sensor – but those haven't exactly become mainstays in the Wear OS world yet. I doubt many people will even use it, and Mobvoi has included it for a while now, but it's nice to see some level of transparency an age where data privacy is becoming increasingly important. Other Mobvoi apps include the TicPulse heart rate app; TicHealth, which keeps track of your steps, distance, calories, active hours and exercise minutes; and TicRanking, which only sought my consent for ranking my steps against other TicWatch users. The Mobvoi apps work well, and the companion Mobvoi app is still easy to use and get around. It's all a bit reminiscent of how the Apple Watch works, but it works. As a fashion wearable, the TicWatch C2 deserves plaudits – it's stylish and easy to wear with anything. As a fitness wearable though there's a lot to be desired, which is a damn shame. Let's just go through this. The heart rate monitor is not accurate. While on a run, it was regularly 20 beats behind a Wahoo Tickr chest strap. So when my heart rate would hit 182 on the chest strap, it'd be around 160 on the C2. The C2 would also take a long while to actually update during the workout. For the first several minutes of my run, it was stuck at 91 beats per minute. This was while the chest strap steadily climbed up to 160 bpm. It was also slow to drop back down from highs. I assumed this was just the live heart rate, and that it would be all fixed up in the companion app – but that wasn't the case. The C2 said I had a max heart rate of 164, while the chest strap got a max heart rate of 189. My average heart rate on the C2 was 122 – on the chest strap it was 150. The GPS performance also left a lot to be desired. While the C2 actually got a connection must faster than the Fenix 5, it missed a lot of the details of my route. The C2 said I went 0.21 miles while the Garmin said I went 3.8 – wild difference. You can see the disparity in screenshots below. On the Garmin, I could zoom in and get granular GPS data, like turns and going in circles. On the C2 it just saw me running as a straight line. Even worse, the data was just presented in straight lines. So I went ahead and re-tested the GPS. The second time was much better, with 0.23 miles for the C2 and 0.28 miles for the Garmin. Still not exact, but actually in the same ballpark. However, the map issue was still the same. While the C2 did a better job of showing where I went, it lacked the granular detail of the Garmin. For instance, on the Garmin I began and ended at the same spot with some going in circles. On the C2, I started and ended at different spots – and you couldn't see me going in circles. The C2 has fitness chops, but if this is your primary purpose for buying, think again. Mobvoi is promising about a day and a half of battery life here, and in my experience it exceeded that. I got two days fairly easily. In fact, I stress tested it during a grueling day at CES 2019 – and I finished the day with just about 60% left. That's wonderful. Now, two days of smartwatch battery life still isn't the ideal. You can't exactly do sleep tracking with that, but it's better than some Wear OS watches I've tried. If you forget to charge the C2 one night, you're not going to be doomed the next day. The TicWatch C2 is a tale of two watches. As a good looking smartwatch, it excels. This is a wonderful design that feels and looks great to wear. As a fitness watch though, the C2 is largely a failure. This isn't a big deal if you're looking at the fitness stuff as an added bonus, but look elsewhere if fitness is your primary need. Still waiting for smartwatches to jump on the thinness bandwagon that cell phone makers seem to think consumers want. I'd love an option without the heart rate monitor (but still with GPS) if we could shave off a mm or two of thickness.